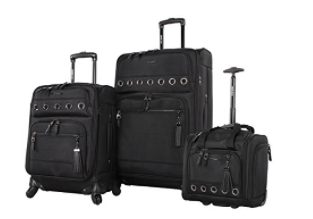 Steve Madden Luggage Set (10487277) is made up of three solid pieces of soft side spinner suitcases with a uniquely modern design and six color options to choose from. These include halo black, luscious silver, b-social black, peek-a-boo black, peek-a-boo grey and peek-a-boo purple. All have the same price tag on the day of this product review. Product rating is 5/5 stars indicating customer satisfaction overall although there aren’t many customer reviews and ratings out yet. We quite like the different fashionable design and the sharp look of these three suitcases no matter what color you choose, they all seem to look good. And it will be easy to pick your bag among lots of bags at the airport. Despite being soft side suitcases they are built quite durable and made from the solid polyester fabric. So your belongings inside the bag are protected even if treated roughly by the airport staff. The spinner wheels rotate 360 degrees in all directions on different surfaces at the airport, parking or other places with also the help of the telescoping push button handle. Two of these three suitcases can both be checked in as carry-on luggage. The one designed as the main cabin bag measures 21.5 x 14 x 9 inches including the wheels and the handle and 20 x 14 x 8 inches without them. It will fit in most aircraft overhead lockers. The second small bag that can be put under the seat in front of you (tested to fit under most plane seats) measures 15 x 9 x 14 inches. And the large suitcase has the dimensions of 29.5 x 18.2 x 12.8 inches with the handle and wheels and 28 x 18 x 10.5 inches, without. They are shipped nested to each other and this is how you can store them especially when you don’t have a lot of space. The largest has a 100-liter storage capacity, standard carry-on is 35 liters and the smallest under seat bag offers 25 liters of storage capacity. You can also expand the suitcases by 1.5 inches through the zipper in the center. The large suitcase weighs just over 10 pounds, cabin bag 7.8 pounds and under seat bag is just 5 pounds so you can fit in a lot more without going over the airline’s weight limit and avoid airline luggage fees. You have the ergonomic handles at the top and on the side apart from the locking telescoping handle. You also have the name tags on the large and the cabin suitcases but not the smallest under seat bag, which is fair enough. As a good quality, sturdy and durable product it is offered with a decent five-year warranty by the manufacturer. It is a very good quality set of luggage, they should prove durable over time and each of the three pieces and parts works as promised, have a unique design and look great.